New Zealand architect Marshall Cook writes about his approach to residential architecture, how site and context affect the design, and how a house must adapt as its users move through life. The daily mood shifts around the compass and the clock. Also to be taken into account is the effect that a new building will have on the existing character of the neighbourhood. We should consider both the built and the natural aspect. It’s my belief that the new house should ‘grow out’ of its existing conditions and quietly assume its rightful place. The east is youthful, innocent, fresh and promising whilst the north stimulates clarity and spirited activity. The west is restful, waning, thoughtful and the south maturity, acceptance and wisdom. Added to the daily mood shifts around the compass and the clock are seasonal changes and weather patterns. We need to account for these and where possible, capitalise. The most frequently performed tasks should be the most efficiently planned. A space that is either too large or too small influences the workload. First, consider how small a room could be. Next envision how many tasks can be accommodated within that space, and how these might change over the life of the house or the life span of the occupants. Over time, the inter-generational demands on a house effect more than planned separation zones or allowances for changes of equipment. Material wear and tear and the degeneration of finishes begins at floor level and ascends the walls like rising damp as children progress through to leaving age. Appliances change function, size and energy consumption. Additionally the demands of the occupants shift and vary as seasons progress and years pass. People shrink with age. When dressed in winter clothes, we are wider than in summer garb. Teenage children consumer twice as much food as pre-teens and three times as much as adults. To retain relevance, kitchens, bathrooms and service rooms need to adapt to the changing patterns of users’ needs and physical capabilities. Children’s bedrooms can evolve to act as their living rooms or studies, ending up as entertaining areas. Garages can become recreational rooms, granny flats or student accommodation. It makes sense to plan for these changes in use by allowing for extra plumbing, drainage and other services. Establishing your brief by defining the demands for present needs should expand to encompass future possibilities. Any potential growth or shrinkage needs to be evaluated. Tomorrow’s surpluses can overwhelm today’s shortage. This style of planning doesn’t necessarily result in a useable blueprint for the future but it will expose criteria that should be prioritised. There is a fundamental distinction between the aims of providing for the rituals of domesticity and satisfying human perceptions of beauty. From the outset, the plan or layout is essentially objective. It fulfills the demands of the brief and satisfies the constraints of the neighbouring environments. 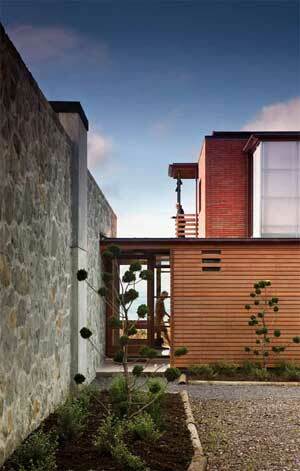 The plan describes how the house and adjacent outdoor area are enjoyed by their occupiers. The aim of the exercise is to create a sense of place, a pride of belonging and to celebrate the contribution that a beautiful house can make to everlasting memories.